"Burnt District, looking Northeast from Exchange Street." Burnt district, looking northeast from U.S. Custom House, showing Saint Stephen's Church. "Burnt District, looking Northeast from Exchange Street." (1866). 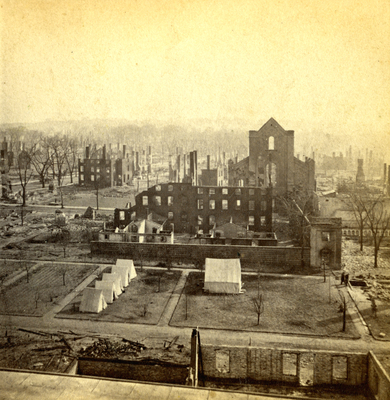 The Great Fire : 1866 - Stereoscopic views. 9. Portland, Me., Great Fire, Portland, Me., 1866, Middle Street, Exchange Street.